There are many tools available to help you edit your eBay listing photos. 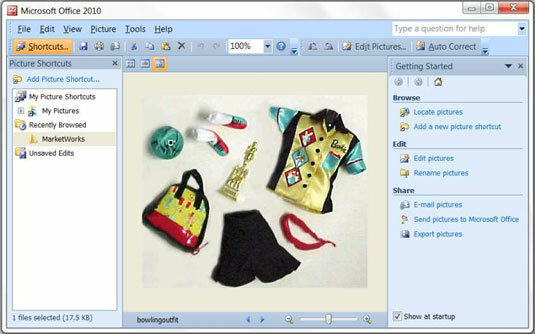 Microsoft Office Picture Manager is a software program included with Microsoft Office suite starting with the 2003 version through the 2010 version. (It replaced Microsoft Photo Editor, which had been included with the Microsoft Office suite since Office 97). Picture Manager offers basic picture-editing features, and it may be a good place to start. If you have Microsoft Office (2003, 2007, or 2010), you find Picture Manager on your Start menu under Microsoft Office Tools. Right-click the image in one of your folders. From the menu that appears, select Open With and then Microsoft Office. Although it seems a less-than-intuitive tweak, Microsoft chose to remove the reference to Picture Manager from the menu options. Go figure. Meanwhile, your image opens in the photo editor. If the toolbars and panes don’t appear when the photo editor opens, click View→Task Pane. In the Task pane, click Edit Pictures and all the necessary commands to complete your masterpiece will appear. Microsoft Office Picture Manager gives you some useful tools: You can auto-correct, fix “red eye,” enhance color, adjust brightness and contrast, compress, resize, crop, and rotate. It’s about all you need if you take a good photo to begin with. Clicking the Auto Correct button works well to correct the quality of an image. Click Export Pictures, and in the resulting Export task pane, you can choose the exact size for the final image.